Some plugins (Atmosphere, Falloff Lighting, Rack Focus and Depth) inside the Buena Depth Cue package also come with a helper plugin that does the tedious work of applying the effect to all the layers in your composition and hooking all the parameters up to a master set of controls. This allows the plugins to render their effect even when you aren’t playing back the composition, but merely moving the camera or layers around, for example. You should always apply the effects using the helper plugins and never by hand, even if you’re only applying them to a single layer because the effects contain hidden controls that the helper plugins connect to various layer properties using expressions. However, you don’t need to know how to use the expressions to use the plugins. Let’s look at the Atmosphere plugin as an example of how to apply the effects. First, create a composition which contains multiple 3D layers. You can use colored solids or video layers. If you’re using text layers, you’ll need to precompose them because text layers always have their transforms collapsed. That means that effects can’t properly locate them in 3D space like they can with video layers and solids. Once you have your layers placed in 3D space, you can set up a 3D camera if you’d like, too. 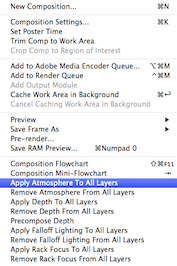 Finally, select “Apply Atmosphere To All Layers” from After Effects’ “Composition” menu. The Atmosphere Helper plugin does the following things: First, it creates a null layer called “Master Atmosphere Control” and applies the Atmosphere effect to it. Next, it applies the Atmosphere effect to every 3D video or solid layer in your composition. Finally, it connects each of the layers’ Atmosphere parameters to the “Master Atmosphere Control” layer’s Atmosphere parameters. That way, when you want to change the look of the Atmosphere, you can simply change the parameters on the “Master Atmosphere Control” layer and all the other layers in that comp will update. If the background color of your composition is￼ different from the color of the Atmosphere, you’ll be prompted to make them match as shown on the next page. Unfortunately, at this time, there is no way for a plugin to set the composition’s background color automatically. If you add a layer later and want to have the Atmosphere effect applied to it, simply choose “Apply Atmosphere To All Layers” again, and it will be added to the new layer and its controls connected to the “Master Atmosphere Control” layers’. Layers which already have the Atmosphere effect applied will not have it applied again. The other plugins in the set work in the same manner. To apply them, choose “Apply To All Layers”. You may notice that if you choose the master control layer and show its Effect Control Window, that it shows one set of parameters, but if you show the Effect Control Window of a video layer, it has a different set of parameters for the same effect. Parameters that apply to all layers show up in the master control layer’s list of parameters. Parameters that only apply to a single layer show up in that layer’s list of parameters. For example, both the Atmosphere and Rack Focus plugins require you to set the input gamma of the video. Since each layer may have different initial gamma, you can set each layer’s gamma parameter separately. As stated previously, all layers probably need to have the same atmosphere color or the effect won’t look right. So the atmosphere color parameter is only available on the Master Atmosphere Control layer, and not on the individual layers.